On a hot summer day, when I was a kid, I’d line up at the local variety store with throngs of others and wait for a Slush Puppy. The counter person would turn back the handle and out would pour a sticky, icy, day-glo concoction. It was happiness in a cup and I’d always get blue (what flavour was blue??) and it would stain my tongue and give me a brain freeze. It was perfect. Summer has come to Vancouver with a vengance and all I’ve been wanting is a bit of cooling off. A slushie would hit the spot, so I looked into my freezer to see what kind of makings I had. A can of frozen lemonade leftover from a party? Check? Frozen strawberries? Ice? Check and check. The result? Holy brain freeze territory! 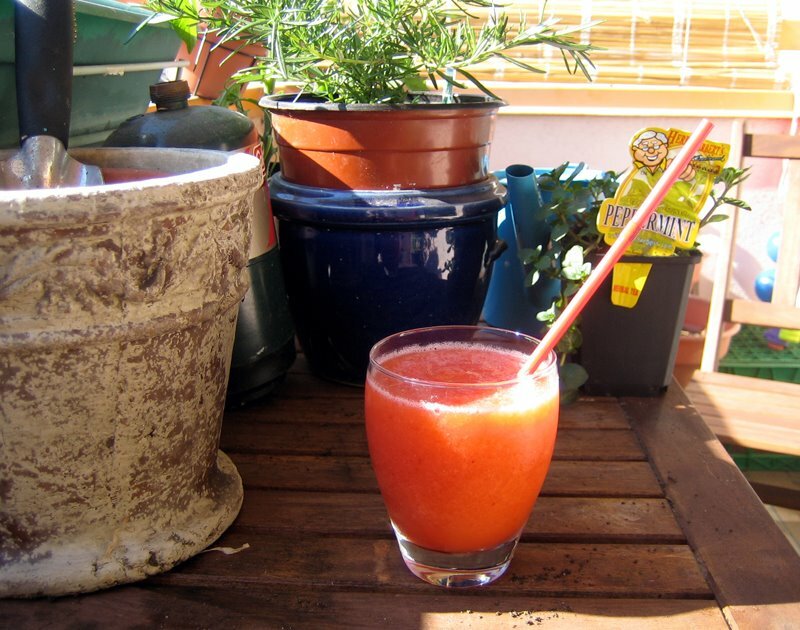 It was sweet, it was icy and it was the easiest and tastiest way to beat the heat of summer. Want a more grown-up drink? Add in 6 oz of white rum and you’ve got yourself a pretty simple & tasty daqueri. Spoon out half the lemonade into a tall pitcher. Add in the strawberries and lemon juice. Top with water. 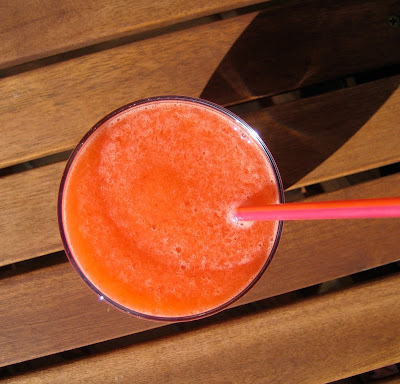 Use an immersion blender to blend it all into slush, adding more water if necessary. Add in a few ice cubes and crush those up too (and rum, if that’s the way you roll). Pour into 4 glasses. Let the brain freeze begin! I'm with Tara. I want to be adopted into your family. Slushies for everyone! oooooh, i wonder if we have any rum? i could use a good grown-up brain freeze. My boys would flip over this. I grew up drinking Slurpees from 7-11 and I still love them. oh yeah baby! that looks so cooooool and refreshing! I loved slush puppies too! OH I can just remember those days. 🙂 It's rainy and chilly here today, but I'll put this one aside for when things start to heat up – which will hopefully be soon! blue was (and still is!) raspberry. this looks yummy and refreshing! I also checked out your etsy site and it's great! if it ever stops raining in nyc i might actually get a chance to make one of these!! yes to @amliag – blue is raspberry (and I loved it, too!). Tea, you are a most welcome family member! A grown up brain freeze would definitely hit the spot, Tree! Dana, this is more immediate than a 7-11 slurpee (that is if you have all the ingredients and the 7-11 is 7 blocks away). Bijoux, get yourself some trays! Ice is soooo needed this summer. Katrinka, yes, I guess it was raspberry, but I don't think it tasted especially like raspberries! Eatme, I was happy to find that this worked beautifully with my Braun hand blender! Culinary, soon it will be hot where you are….just as I'm sure this heat wave won't last forever here. Catskillkiwi, yikes, rain isn't fun! Hope for sun! Shannalee, the immersion blender was so perfect and made for easy clean up. This sounds soooo tasty! I really love lemonade, and I bet the strawberries give it a great twist! finsmom, the strawberries take this slushie to nirvana. really. 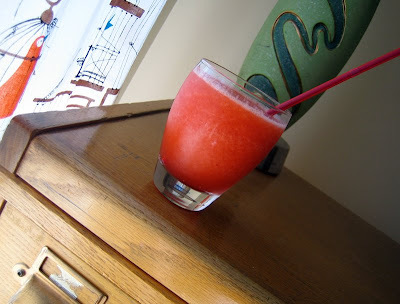 Sarah, I actually remade a version of this with cranberry juice and frozen strawberries. I also threw in some Jack Daniels for good measure…and lots of ice. Yum! since I am currently addicted to Otter Pops, and eat about a dozen of them every night, this is right up my alley. Yum! Soon, Then I have no idea what otter pops are, but now I have to have one! emilyflippinmaruna have a great solstice party!! Hooray for summer! I liked the sound of this, soI made it, but mine was really sour. Maybe my lemon was too big/juicy? Kathleen, it could be. I added the lemon because I find the commercial lemonade really way too sweet (but I do like things on the sour-side!). Use less lemon next time or leave it out completely. Or just add in enough sweetener to get things the way you like it!